Toys, kitties & tunnels, oh my! As a breeder, I have an opportunity to make a dramatic impact on your puppy. What sets us above the rest is the enrichment we provide for our litters. Since I am a positive reinforcement dog trainer and been raising litters for 15+ years you can be rest assured that the puppies from us will have the best first 8 weeks of life as possible. I am constantly on the prowl for new things to introduce our puppies to. We go the extra mile to make sure that our puppies have the best start in life as possible. So much goes into producing high quality dogs. A percentage of a dog’s temperament and ability to perform certain tasks, etc. is based on genetics. The other percentage comes from how the dog is raised, training, management and nutrition. While we don't know what the exact percentages for each are we do know that BOTH of them play a huge part in the temperament of a puppy. We can use this to our advantage to develop the very best and balanced program possible. We start by conquering the genetic part first by producing the finest puppies genetically. We do this by selecting our parent dogs based on temperament and other non-superficial and valuable traits while having a solid understanding of genetics so that our efforts actually produce quality. And not only do we look at the parents, we look at other relatives as well. We balance health in there as well because an unhealthy dog can become a fearful or aggressive dog. But what do we do to work with the non-genetic percentage? We provide an immense amount of optimal nutrition, training and management for the first 49 days of life. After that the very critical following two months are up to you, the new owners. By the time you bring your baby home we hope to have provided enough resources that all of you will be very ready to continue laying the foundation for a most excellent companion. So you could say that apart from genetics, nutrition, training and management I also strive to provide the education needed for new homes to continue the work on the foundation I have worked hard to solidly lay. Our puppies start off by being born in the house. This allows us to keep a close eye on mom and babies so we can make sure everyone gets fed, cleaned and stays warm and to make sure mom is recovering okay. It's messy, loud and we don't get much sleep for the first couple weeks but we love our girls and want to make sure they are comfortable and happy. The puppies are handled every day, if not multiple times each day, while they are weighed, examined and cuddled. We breath on their faces, look in their ears, feel their feet and tails. Gentle handling causes healthy stress and imprints pups on people. From from 3-16 days old they are put through early neurological stimulation AKA the "Super Dog" program. ENS is a structured program of six exercises for baby puppies–four positions, foot tickling and a cold surface. ENS as a part of puppy rearing has been shown in countless studies to have very real and measurable benefits in puppies. The stimulation exercises improve the overall health and immune system of the puppy and not just the temperament and mental adjustment of the puppy. In addition to ENS we introduce the puppies to scenting on days 3-16 days as well. Each pup is presented with a different object to smell for 3 to 5 seconds. We use things like essential oils, dirt, wood, leaves, grasses, fruits, leather, plastic, and metal. Puppies as young as 3 and 4 days show clear likes and dislikes. It's amazing to see! Between 3 & 4 weeks we do startle & recovery exercises which teaches pups to bounce back from fearful experiences. We condition the puppies to be emotional resilient by triggering their startle recovery cycle when they are only 3-4 weeks old. The more times the puppies startle and recover during this window of time, the faster & better they're recovering will be as adults. We drop dog dishes, drop stacks of books, slam doors, start the vacuum, start some power tools and startle them with objects, so they experience being surprised and recovering from it again & again. When the puppies are 3 weeks old they have a startle response but they recover almost immediately and studies have shown they they have no real fear response to anything at that age. At four weeks, puppies undergo a dramatic transformation, going from fully capable nursing machines to young dogs. Although most people think that is when you start developing puppies, these important things above help to develop newborn puppies during their first month of life. Around 4 weeks of age the puppies start getting active and mobile so they are moved to our roomy “puppy barn” that has outdoor access and plenty of room for them to run around and play. We still bring them in the house every day and each puppy receives daily individual attention as well. We provide lots of toys & stimulation for our puppies. We built an "Adventure Box" that is always a huge hit. We have a wobble board that helps desensitize them to being on a moving surface. We have several different types of tunnels and a "bottle pool" that they love to dive into. We start taking the puppies on nature walks around our property where they meet our other animals (horses, donkeys, chickens, ducks, geese, pig), play in the ponds, jump over logs and just have fun running around and playing with their mom and our other dogs. We try to take them on a new adventure every day. Around 4 weeks is when we introduce the puppies to “puppy mush”. We allow the moms to control the weaning process. We will never take a mom away from her puppies. Our puppy barn has raised platforms so moms can get a break away from the puppies whenever she likes. Usually moms will start weaning the puppies around 4-5 weeks old and that’s where we come in! We feed the pups 4-6 times a day and they quickly learn that food is good. Carpet, Concrete, Wood, Vinyl, Grass, Dirt, Gravel, Wood Chips, Newspaper, Etc. Big Balls, Small Balls, Soft Fabric Toys, Fuzzy Balls, Squeaky Toys, Metal Items, Wooden Items, Paper/Cardboard Items, Milk/Soda Jugs, Etc. Front Yard, Back Yard, Basement, Kitchen, Car, Garage, Laundry Room, Bathroom, Crate, Kennel, Etc. Climbed a box, Climbed off a box, Go thru a tunnel, Climbed up steps, Climbed down steps, Climbed over obstacles, Played hide & seek, Go in & out doorway with a step, Learn to Back Up, Etc. Metal, Plastic, Cardboard, Paper, Glass, Pie Plate, Frying pan, Etc. Crate, Yard, Kitchen, Basement, Laundry room, Bathroom ,X-pen, Etc. We spend A LOT of time with the pups and each and every one of them is special. Because we spend so much time with them we get to know their personalities pretty well! This helps us place the right pup with the right family. 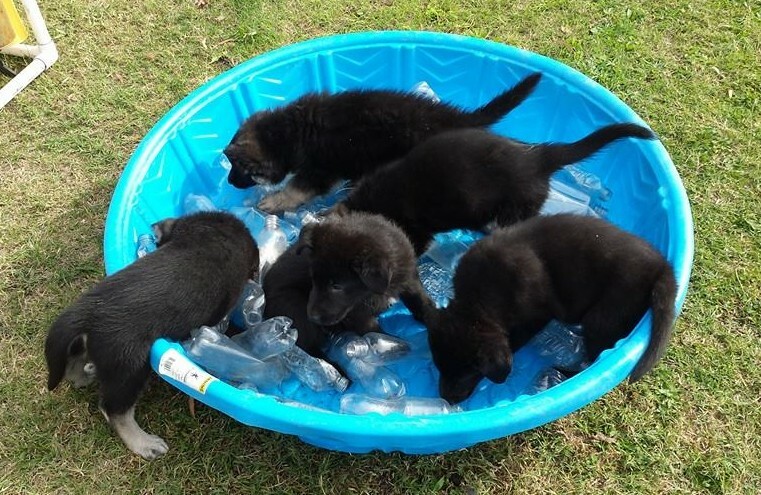 Be sure to watch the slideshow at the top of this page to see all the activities are puppies do and also visit the websites below to learn more about some of things we mention above.